Being involved in the retail and trade show display business and seeing pull up banners go out to customers on a daily basis, I think I have a good feel of what makes an effective banner design. And when you consider that the artwork and graphics are the very element that will “make or break” your banner display, you may want to read on! Though you may feel limited to a particular colour palette that compliments your corporate colours and logo, great results can be achieved using colours that create strong contrasts. Whether its light on dark, or dark on light, or colours at the opposite ends of the colour spectrum, contrasting colours are very effective at catching the viewer’s eye. So be bold in your use of colour, but don’t over-do it. Try using just 1, 2 or 3 strong, contrasting colours – any more and you’ll start losing impact. It can be tempting to try and get the most value from your trade show banner by loading it with images and artwork. Despite the temptation, I find that the vast majority of the time, one large image is more effective that a number of smaller ones. Multiple images act to dilute the visual impact of your banner as each image competes for the viewers’ attention. On the other hand, having one large, primary image creates a strong focal point that is very effective in the kind of open trade show or retail environments in which banner stands tend to be used. In both trade show and retail environments the key function of a banner’s design is to grab the attention of the people passing your store or exhibition stand and entice them to approach. Bearing in mind that you may have just seconds to achieve this, large amounts of written information are most often counter productive. Keep your message short and simple by using large text, bullet points and images where possible. A clear “call to action” can be effective in having people approach, upon which a staff member, some printed material, or both can leave them with more detailed information. I guess in summary, you could say that when it comes to trade show banners, simplicity is the key: Simple yet bold use of colour, clear and strong images to create a focal point, backed up with some brief written information and a “call to action”. Effective banner design is not rocket science, but unfortunately more often than not, trade show and retail banners end up being less than effective. But now all you’ll need to do is follow these 3 simple rules to good banner design and you’ll be sure to get the most from your next banner stand investment! 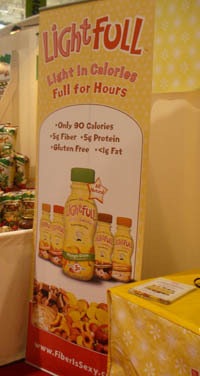 Do you have any more ideas for producing effective trade show banner designs? Danny Jessen is Marketing Manager at Slimline Warehouse Australia a trade show and retail display company, specialising in Pull Up Banners. As a long-time distributor of the Classic Exhibits line-up of tradeshow products, it’s great to see that there is now a ‘deep-well’ way to search out one of their exhibits for your specific exhibiting needs. 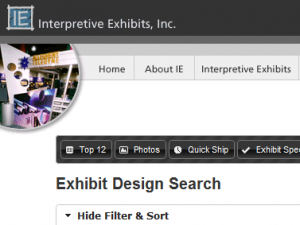 Exhibit Design Search (link here and also on the navigation bar above) takes you to the database of hundreds (if not thousands) of varieties of exhibits. 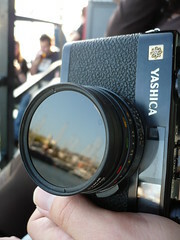 These range from small accessories such as round graphic stands (definitely cool!) to large island exhibits – and everything in between. To use Design Search, just click on the link and head to the site. Here’s where you’ll find the opening page which is designed to let you intuitively and quickly find what you’re looking for. If you don’t know what you’re looking for it’s a great browsing tool. Along the way you can view the Top 12 exhibits, catch a Photo Gallery, see what exhibits can be quickly shipped if you’re in a hurry, check out the Specials and even browse the dozens of Tradeshow Tip articles. Beneath each exhibit rendering you’ll see a link labeled “Add to My Gallery” – when you click that you start to create your own line-up of favorites or exhibits you want to save and review closer later. It’s a great way to share with other team members to get their feedback. The drop-down menus allow you to filter your search using price points, booth size and lead times – as well as give you the opportunity to do a text search. Now all of that by itself would be pretty damn cool. Almost awesome. But here’s what takes the Design Search tool to the next level: the burgeoning P_5_D photo gallery. P_5_D stands for ‘Past 5 Days’ and it is an on-going stream of photos of exhibits that go out the door. Not only does this let you see what other clients are interested in (and have put $$ down on), it allows you to see how each one of them has possibly made adjustments and alterations to a standard exhibit. A great way to help generate ideas, eh? Plus: each photo is of something REAL that was actually created – not just a computer rendering of what something is SUPPOSED to look like. Getting a chance to see the real stuff shows you how it would look in your booth. And if you check the drop-down navigation under the ‘View By Week’ tab you’ll see that the photo albums go all the way back to late 2006 – almost four years of product that has gone out the door to happy customers. All in all, Exhibit Design Search is a fun way to waste a bunch of time AND look like you’re working at the same time. So if your boss comes in you can tell her that you’re researching the company’s new exhibit possibilities. And hey, chances are pretty darn good you’ll find something that will exactly fit what you had in mind! So you’re ready to move into getting a new custom-built booth. But one of your main concerns is the type of material that will be used to fabricate the booth. 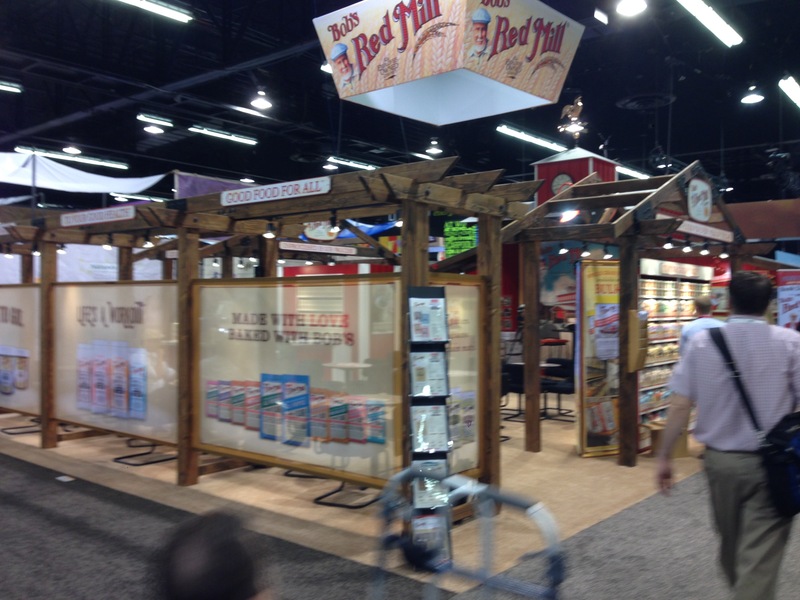 Of course, your exhibit company should be up-to-date on all of the latest materials available. 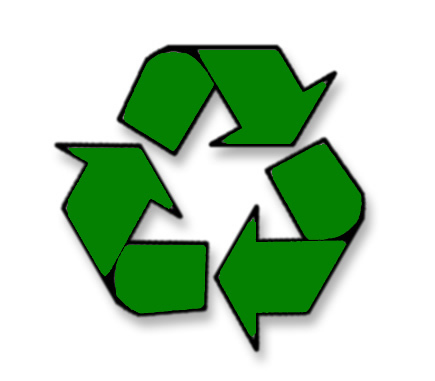 So be sure to raise the question of sustainable materials with your booth fabricator. Some of the materials that might be considered include bamboo, FSC certified wood, recycled metal, low VOC, organic or recycled latex paint, or tension fabric (low weight which cuts down on shipping costs and the carbon footprint of the shipping). Many booths may be made with re-claimed materials, which can often be sourced locally. If those materials can be sourced locally, they need less transit time and cost. Plus for each dollar spent locally, three dollars stay in the community so spending locally reduces carbon usage and helps sustain the local economy. It’s true that many sustainable choices are not cost-neutral, and in fact may bust your budget. When one client of ours constructed a new booth a few years back they explored a variety of materials options,. Even though they wanted to use those sustainable materials, it turned out to have enough impact on their budget that the decision was made to use more typical materials for fabrication. Beyond that it didn’t give them a look they were comfortable with. The financial and aesthetic considerations outweighed the desire to use sustainable materials. There’s no wrong answer and each project requires its own examination – but one worth pursuing, as there are new material choices coming to market all the time. You’ve seen them for decades. Probably set them up at tradeshows. Maybe loved them, or cursed them. It’s…The Curved Back Wall Pop-up Display! They’ve been around so long it’s hard to pinpoint exactly where and when they started. I’ve tried to no avail. I’m sure some archaeologist will someday find the first curved back wall display with a caveman skeleton embedded in the rock next to it. Maybe the display will be advertising Saber-toothed tiger hunting tools, mmm? Let’s face it – this display is an easy solution to the challenge of creating a low-budget, easily-transportable and easily set-up tradeshow booth. Some view it as a cheap alternative to a more custom look. 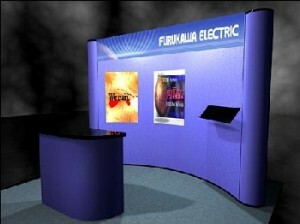 And it’s true, a custom booth often stands out more than the curved back wall pop-up display. 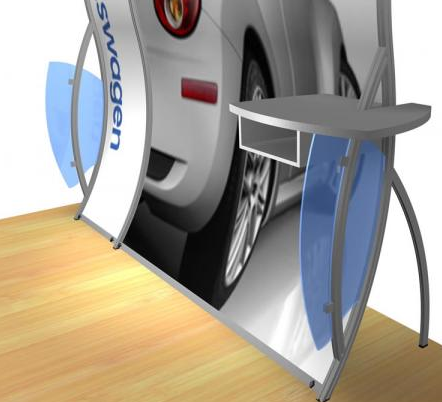 But in a sense the curved back wall pop-up display is an elegant solution with quite a bit of flexibility. First, of course, is that you have the choice of using either fabric panels or graphic panels. Fabric panels in a multitude of color options give you the ability to attach any graphics or photos or messaging you want with Velcro. Graphic panels that go from floor to the top of the exhibit can create a stunning look. I’ve seen some curved back wall pop-up displays adorned with such powerful photographs that I’ve stopped in my tracks. Many of the newer curved back wall pop-ups have the ability to install shelves for monitors or to display other items. When a visitor sees a shelf it’s a little unusual so that can also be a good attractor. And with the curved back wall you have the ability to shift the display around a bit for greater effect. Let’s say your booth is open on two sides. By shifting the booth a couple of feet in a semi-circle towards your neighboring booth (without going so far as to violate height restrictions), you open up both open sides of your booth to visitors, which makes your entire 100 square foot space more inviting and accessible. With the evolving fabrication techniques, a curved back wall pop-up should last a damn long time, too. A reputable manufacturer offers a lifetime warranty on parts and labor, so your investment is minimal – and a good one. 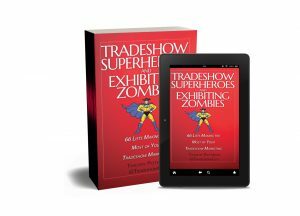 Finally, the ability to set up the booth in short order – even by someone who’s never done it before but can read and follow directions – makes a pop-up the Swiss Army knife of exhibiting. Add in the ability to convert your carrying case to a counter-slash-storage unit gives you even more bang for your buck. So that’s the Curved Back Wall Pop-up Display. Pricing ranges from about $1,000 up to $3,000 or so depending on size, style and manufacturer. If you price-shop online to get the lowest price possible you can probably beat that. But if all you’re looking for is the lowest price, a word of advice: yes, you may get the lowest price – but are you getting a product that will still be giving you service in ten years? Sometimes investing a little more time in checking out the actual product (how it’s made, what the warranty is, who is making it, etc. ), and investing a bit more $$ means you won’t be kicking yourself in a couple of years because the cheap version broke after being set up just a few times. It may seem like a no-brainer…but did you get photos of your last tradeshow booth set-up? I mean, did you really get enough photos so that you can answer any questions that may come up before you have to set it up again? Since the advent of digital photography over a decade ago, taking dozens of photos of any business event is much easier and cheaper than the old days of film. And it can be extremely useful. Chances are at some point you’ll be glad that you took a lot of photos. Whenever I’m at a show where our booth clients are set up I make sure to get several photos, including close-ups that reveal how things were set up. And no matter how many photos I take it seems that a question comes up that makes me wish I’d take just a couple more! Plus, photos give you a good excuse to post the best ones on Picasa or Flickr and invite your clients or potential clients to come by and see your cool booth. 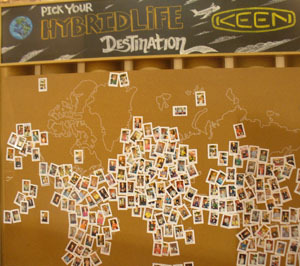 No doubt you can think of other reasons to have several photos of your booth on hand. Take pictures from all angles – you never know when someone might ask how much storage room you have behidn the back wall. All you have to do is pull out a photo and show them! The latest issue of Exhibitor Magazine hit my mailbox last week, highlighted by their annual look at industry cost averages. Now I’m not going to throw all of their numbers out for you. If you want ’em all, check out their website or buy the magazine. They usually release the current online version a few weeks after the paper version has been out. But I do want to take a gander at a few of the numbers in general terms. A few of the main figures that we always work with our clients and prospects here at Interpretive Exhibits are: industry average cost for custom booths, inline booths, and design and fabrication. According to the figures just released in the November 2009 issue of Exhibitor Magazine, rates are up approximately 25% since the beginning of the decade, or less than 3% per year. According to data from InflationData.com, the yearly average from 2000 – 2008 is 2.89%. The figures through September of 2009 shows mostly negative inflation, and those figures were not included – but obviously they would pull the 10-year average down. Conclusion: Nothing really surprising here – actually I would view the figures as somewhat encouraging as some of the basic costs of designing and fabricating a custom booth are in line with inflation. 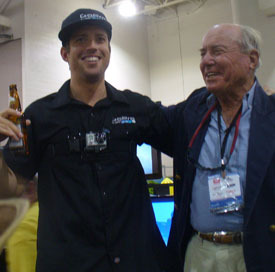 Without giving out the actual figures compiled by Exhibit Magazine – after all, they did the work and until they post them online I don’t think it’s fair to jump the shark with their specific numbers – it appears that the key figures we track in the exhibit industry have risen in line with other prices. PS. When Exhibitor releases those numbers online, I’ll look to post a link do you can review all of the figures.